This week was, without a doubt, the worst of the season for the men’s squad. After an extremely promising start to the season, the team dropped two this week and three in a row, and has fallen to 12-4 on the season. On Wednesday, the team lost at Rutgers 64-61, which was the beginning of some questions about this squad. While the loss to Syracuse earlier in the season may have been a bit questionable, the only other blemish on the team’s record was against No. 6 Michigan State. Rutgers certainly doesn’t hold a candle to those two squads, yet found a way to beat the Buckeyes on Wednesday. Kaleb Wesson still stuck out on the stat sheet with 18 points and seven rebounds, but a team effort of only 61 points was a season low. Against Iowa, the offense seemed equally anemic, and the Hawkeyes were able to secure a 72-62 victory. Andre Wesson led the Buckeyes in scoring, but put up only 13. In the game, the Bucks turned the ball over 21 times and shot under 40 percent from the field. Kaleb Wesson was held to two points in 23 minutes. The team’s next game will be on Friday, Jan. 18 against Maryland. 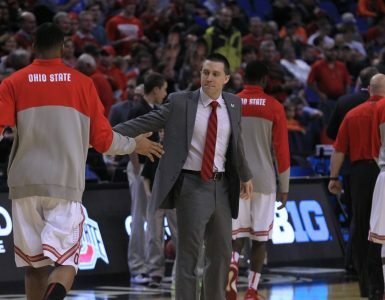 This week was a bright one compared to recent performances by the squad, as the Buckeyes snapped a five-game losing streak with a 55-50 conference win over Indiana on Thursday. Carmen Grande went off for the squad, tallying 19 points, five rebounds and five steals. Dorka Juhasz grabbed 10 rebounds and got 9 points, and the team forced the Hoosiers to turn the ball over 19 times to secure a victory. The team’s next game will be Monday, Jan. 14 against Michigan State.